In this page you'll find an amazing collection of piano sheets of your favourite Christmas Songs and carols arranged for beginners at level1. 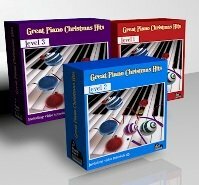 The first level is for the total beginner, written in a unique and special way that allows you to play great Christmas songs even if you have never played the piano before. Whatever your age - if you are a child, adult or a senior citizen - you will be able to play the Christmas songs which appear in this book. A note to parents - we are sure your children will enjoy starting to learn how to play Christmas songs on the piano with our easy and unique method! Click here if you haven't signed to Piano Playground, our free E-zine. Make sure you do that in order to get the USERNAME and PASSWORD for the Jingle Bells free piano tab I provide here under. Would you like to have more of these piano sheets and videos at the same level? 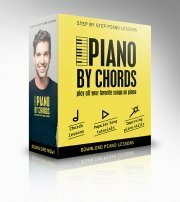 Do you want to improve your piano skills and play these songs with an accompaniment? Check out these 3 E-books with beautiful arrangements and clear video demonstrations of more then 20 songs at THREE LEVELS, based on A method that allows you to play your favourite Christmas Piano Songs and improve your coordination without having to read Piano Notes. Now at a special Christmas DISCOUNT! Click here to check out the Great Piano Christmas Hits Now!